Storytellers Camp" on Monday & Tuesday of Spring Break, 2016. At Willow Nest Studio, children are the creators and protagonists of their own stories. Elisha Georgiou, founder and director, welcomes children to take part in joyful experiences filled with creativity, song and friendship. In our camp, children ages 4-7 will explore creating original stories through dramatic play, shadow-making and songwriting. Children will construct story props using a variety of art materials and found objects. Workshops will take place at Willow Nest Studio, on 16th Street in Windsor Terrace, and will include a lunch break and activity time at the Southwest end of Prospect Park. The camp will be co-taught by Elisha Georgiou, Ed.M. and Kristin Eno, Ed.M, arts educators who have worked together in many capacities for over ten years. Fee: $100 per day, $180 for two days. Sibling discounts available. Let's put our brains and hands together and build a Mini Materials Center at the BNS Makerfest! Teaching Beyond the Square is looking for a permanent space for its vast collection of recycled materials, which will be made available for use by all schools in NYC, with a particular focus on early childhood programs located in under-resourced areas. Continued from the day before/Fri PM: Find & Seek will welcome return students from Friday, as well as new friends! Children will continue to build their story boxes, decorate a door, and include a secret clue. We will facilitate the collaborative drawing of a map of our library community's own "story box village." 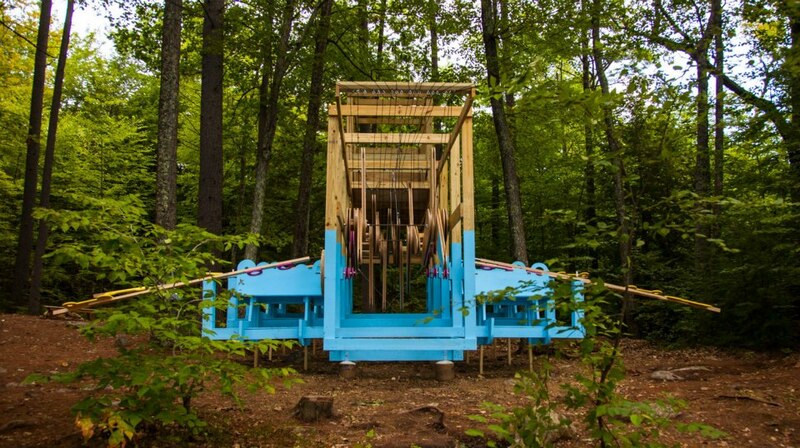 We will foster interactive storytelling based on this original place we have created together. This two-part series will function as a mini "cardboard challenge" that will appeal to older children who are interested in maker spaces, inventing, exploring the depths of books and literature, and creating artistic elements that reference and complement books. 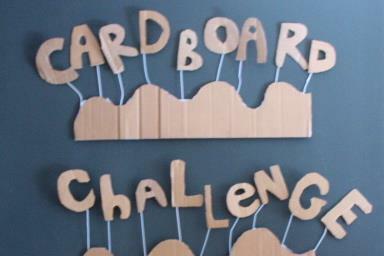 See video of our Cardboard Challenge at BEAM, Fall 2013, which engaged many 7-12 year olds! Children will paint their boxes and put a clue on the outside, and other participants will try to guess the book that each box references. Children can leave their boxes to be worked on the next day, Saturday, in our Workshop Part 2. Elisha Georgiou and Kristin Eno of Find & Seek will present 2 Interactive Puppet Shows based on children's picture books, and will transform a section of the Bedford Auditorium (library's lower level "A") into a cozy story corner, and facilitate exploration and story play with open-ended materials (light/shadow, natural & recycled objects). We will be meeting at the Red Hook library in the back room and patio, for a seven-week Find & Seek series! May 8 we will explore BUBBLES. May 15: WATER and RAINBOWS. May 22: BUBBLES, WATER and RAINBOWS. June 5: NATURE: Creatures, Rocks and Sticks, Seeds and Dirt. June 19: WIDE WORLD of WONDER! The Big Brooklyn Playdate is coming this Wednesday April 29! Parents and caregivers of children ages birth to 3 years can come to Brooklyn's Central Library, Dweck Center, the lower level of the Main Branch at Grand Army Plaza, from 10:30 am – 12 pm. The potential of the humble cardboard box for making real and heartfelt connections is boundless. The Big Brooklyn Playdate is a wonderful and unique event for Brooklyn, which includes a wide range of fun games and activities that delight young children and encourage early literacy. Come to play and leave ready to turn ordinary objects in your home into your child’s favorite toys. Here are some resources the Brooklyn Public Library has compiled referencing reading and playing with your child. So clearly Not a Box, in this case. And so wonderful to see beautiful parent/child connections happening through play. Find & Seek will facilitate an area at the event that will focus on threading wire through reused plastic bottle caps, to continue the exploration we started at Materials Day. We got a great response from children and families who were interested in handling the many colors of caps we had compiled, and who wanted to make snake or necklace-like strands of caps, which could be hung from a structure we made of PVC. At the Big Brooklyn Playdate we will host Part 2 of our Cap House. Find & Seek at Materials Day. We will continue the conversation with caps at the Big Brooklyn Playdate on April 29. What: Find & Seek is leading CURIOUS CABINET, an 8-session series combining elements from our Fall 2013 Story Play and Materials Lab series at the Red Hook Branch of the Brooklyn Public Library. This free weekly program for 0-5 year old children is sponsored, in part, by the Greater New York Arts Development Fund of the New York City Department of Cultural Affairs, administered by Brooklyn Arts Council (BAC). How: We focus on books, of course, as we are in a library! But we also bring into the mix our own special hybrid approach of storytelling, facilitated play and materials exploration. We tell stories in the round. We invite children to act out a story with props made of found, repurposed and natural materials. We foster children's imaginative use of props in their play, and we facilitate healthy play relationships with old and new friends. At times we record the children's dictation of their own original stories, a la Vivian Paley. Other times we film the children's stories (with parents' permission, of course), in the style of Little Creatures Films. We encourage music and movement as extensions of Story, and we welcome the youngest book lovers, babies and toddlers, through our sing-song readings of books and other songs we sing. We have conversations with parents, and we provide activities for the caregivers of young, not-yet-mobile babies. We honor each individual child as a unique human being with a beautiful imagination, and we make sure that children's voices are heard and honored as the amazing storytellers that they all are! In this Spring series, we are making special efforts to include families from all walks of life in our neighborhood of Red Hook, so that their children's experiences of stories and play can deepen in a way that enhances their intellectual and emotional development. Why: Children love story and need to be exposed to story in all its forms. Fewer than 1/2 of America's children are read to at some point in every day, and those who don't end up with a meager "listening vocabulary." 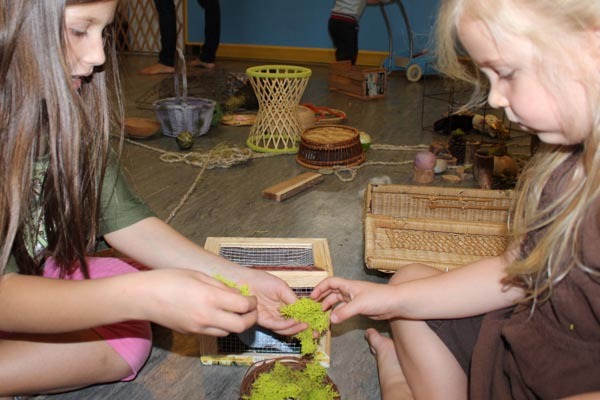 The range of activities available within our workshops provide a powerful collection of child-centered pre-literacy activities for young children. We curate and read a beautiful selection of children's books that highlight play, the beauty of the natural world, healthy social and emotional growth and the wonders of the imagination. We nurture the development of children's poetic voice, facilitating children coming into their own as Storytellers, starting at the youngest ages possible. We not only work to build children's listening and speaking vocabularies, but focus on enhancing children's vocabulary of imagery, through multiple play experiences with a wide range of unusual and beautiful tactile, open-ended materials. Children's imaginations are sparked and the depths of their interests are tapped into, and as a result their brains are "turned on" in ways that benefit healthy human development. When: 10:30am - 12pm. Every Friday, from February 21 through April 11, 2014. Note that the first week, February 21, we will offer TWO sessions! As it's Winter Break for NYC schools. The first will run from 10:30-12, and the second from 2-3:30pm. Where: Red Hook Public Library. 7 Wolcott Street at Dwight Street. 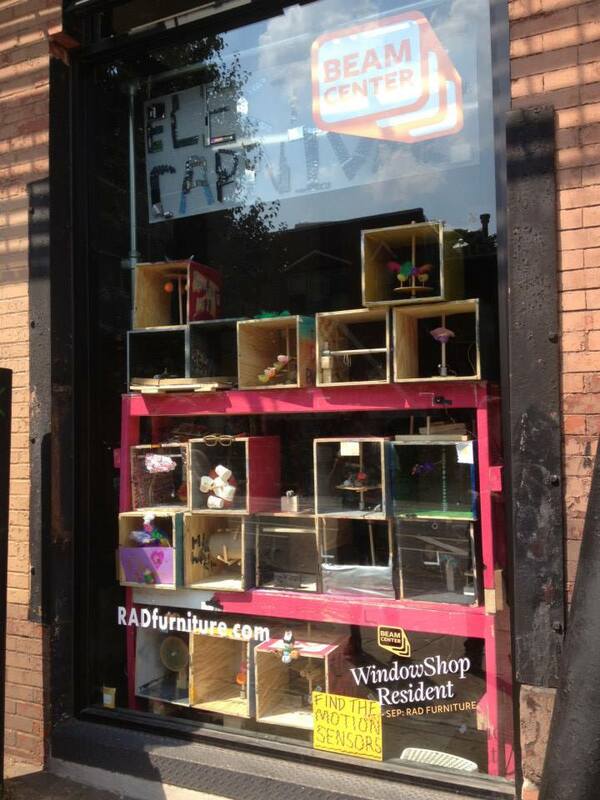 Accessible by the B61 Bus from Park Slope, which passes by the F train station at Smith/9th Street. Close to IKEA and Fairway. Coming Soon: Story Play in the Secret Garden! 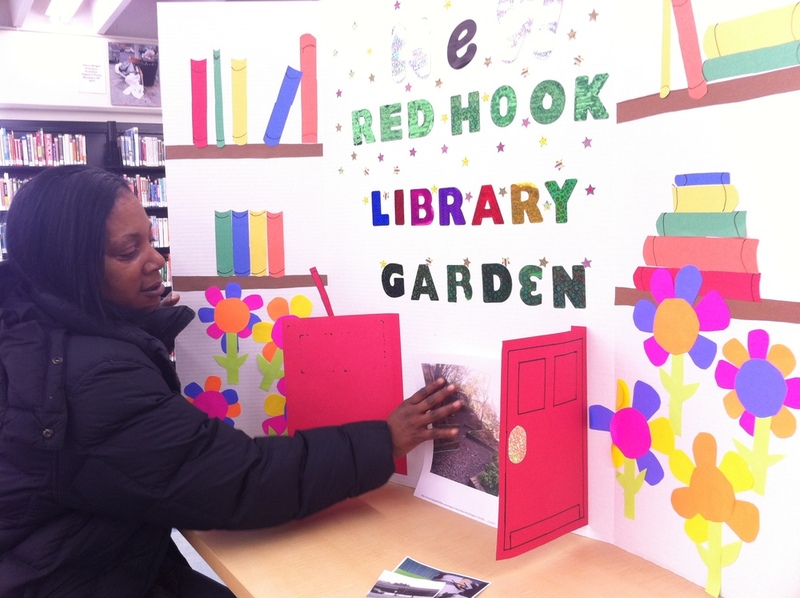 Some of our neighbors have been volunteering time to present the Red Hook Library's garden as an worthy recipient of city council capital funds through the Participatory Budgeting process. If the garden can be renovated through the use of these city funds, it will become more child-friendly, and ultimately we can host our Story Play in this beautiful space, an underutilized Red Hook treasure. The Secret Garden has truly been a secret to most people in Red Hook for the 7 or so years it has been out of use. Sheryl Braxton, a Participatory Budget delegate in Red Hook, puts the finishing touches on the poster she and other volunteers created for the Expo that happened in Sunset Park on March 15. At Find & Seek we remember attending a few PBNYC meetings in Fall of 2013, at which time we threw "Library Garden restoration" into the pool of ideas. Our wildest dreams have come true: something we (and Sandra Sutton, Director of the Red Hook branch) presented as worth of city funds has made it onto the official ballot, and might just win some funding! Learn more about PBNYC. Something super fun about the class is that if you enroll your child, s/he will become an architect of a City of Dreams that many children will be building after class in the space, on October 5. We have responded to Imagination Foundation's Cardboard Challenge, by planning to create a city of our own, right in Beam's space! Our class of 4-6-year-olds will lead the way from 10-11:30 (in our usual drop-off class time), then from 11:30 until 4:30pm Beam will open its doors to children of all ages, for a continued build, as we all work together to create a fantastic structure into which children can go inside and play! We will video this play from 4:30-5:30, at which time we'll Break Down and Recycle our beautiful city. Ah, the wonders of documentation! The video we make will be posted and added to our Cardboard Challenge website, which will be seen by all the world, particularly those 1 million children also participating in respective cardboard challenges. Ah, the wonders of the InterWeb. Not to mention the wonders of children's minds (see Caine's Arcade) and filmmakers' visions (thanks Nirvan Mullick). Prepping some cardboard for the challenge. We will have a second introductory meeting with families who are interested in our Fall programs, on Friday Sept 6 at our new venue, the Red Hook Branch of the Brooklyn Public Library. We will meet in the back classroom at 11am, have a conversation for about 30 minutes, then do a walk-through of the library's wonderful side garden. We will bring a few natural and recycled materials for children to work with. We will bring many full color images of the varied materials that we use in our program.